If you haven’t watched Roma yet, cancel your plans and settle in for an evening in front of Netflix. Roma, a film by Alfonso Cuarón, is in black and white, but don’t let that put you off. Dedicated to Cuarón’s childhood nanny, Libo Rodriguez, the movie centres around one wealthy family and their nanny in 1970s Mexico City. 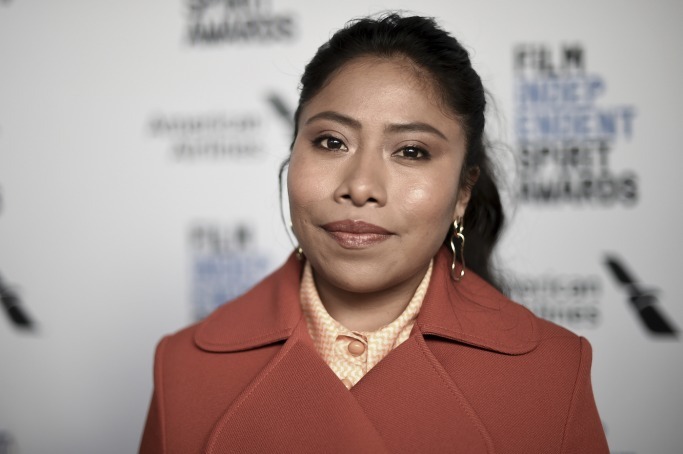 Yalitza Aparicio plays the central character – the carer, Cleo. Cuarón told The Hollywood Reporter that the film celebrates “a character that’s been invisible in most cinema and also society”. It features both Spanish and Mixtec, the indigenous language local to where Aparicio is from. The movie picked up awards for best foreign language film and best director at Sunday night’s Golden Globes, and as we’re only at the beginning of awards season the accolades are likely to keep rolling in. At just 25 years old, this is Aparicio’s acting debut – she has no formal training and only attended the open audition because her sister pushed her to. Since the release of Roma, Aparicio’s star has been quickly rising. Not only is she winning praise for her poignant performance, but she’s also making some killer fashion moves on the red carpet. This is why we predict 2019 will become the year she becomes a true – if unexpected – style icon. We only say “unexpected” because it’s rare for an actor of indigenous origins (her father is Mixtec and her mother Triqui) to reach such a level of success. It’s an amazing achievement for the hugely talented Aparicio – and here’s why her fashion makes her one to watch. Awards ceremonies tend to be dominated by household names – movie stars we’re all familiar with who have walked the red carpet hundreds of times before. 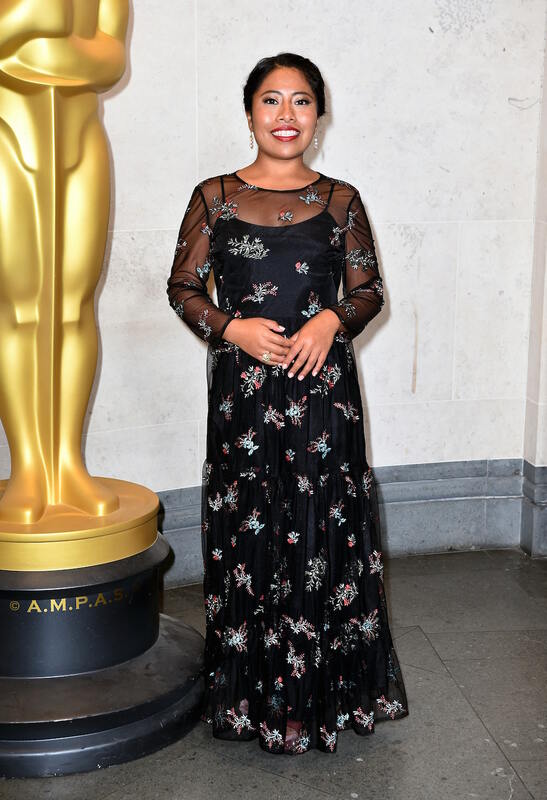 This isn’t the case for Aparicio – as Roma is her first film (not to mention a hugely successful one with a big name director at the helm), she’s been launched into the world of black tie events and photo calls. No one can deny she’s embraced this no doubt strange experience, and Aparicio is becoming increasingly known for her well put together sense of style. She well and truly looks at home posing for photos at premieres and dinners – whether it’s wearing form-fitting cocktail dresses, sophisticated floral patterns or our favourite outfit – that orange double-breasted skirt suit, perfect for the industry brunch she was attending. Just because Aparicio’s style is simple and classic, it doesn’t mean she’s afraid of bright colours. Whether it’s sunny yellows, lipstick pinks or bright lavenders, she can often be seen in particularly eye catching dresses. It’s not just Aparicio’s fashion choices which are winning her fans, but also her beauty style. She’s no stranger to a bold red lip, and this can make any outfit pop. Her hair is enviably long and sleek, and props to her for experimenting with accessories – like the sparkly headband she wore to the Golden Globes. In December, Aparicio was revealed as the cover star for Vogue Mexico. This was a hugely important step because she represents an indigenous minority who are rarely shown in the media – let alone gracing the covers of big magazines. Previous covers of Vogue Mexico rarely featured women who look like Aparicio, so it was a real win for representation in a country with one of the largest indigenous populations in the world. Through her words and often her outfits, Aparicio is helping give people who look like her the visibility they deserve.